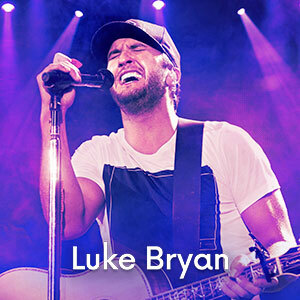 Famed country music star Luke Bryan began his career by writing songs for his high school pals, and current performers Travis Tritt, and Billy Currington. Bryan’s passion for country music was recognized early on, and in 2007 he signed a contract with Capitol Nashville, and soon thereafter released an album titled I’ll Stay Me. After releasing several hit singles in 2009, Bryan then co-wrote, and released his third studio album in 2011 titled Tailgates & Tanlines. Being his most successful album yet, it reached number one on the Top Country Albums chart, and number two on the Billboard 200 chart. Impressively enough Bryan released his first compilation album in January of 2013 titled Spring Break…Here to Party which featured a total of 14 songs. This album reached number one on both the Billboard Top Country Albums chart, and the Billboard 200 chart; making it the Bryans first album to top the all-genre chart. Marking Bryan’s fourth studio album, Crash My Party was released in August of 2013, and it premiered at the 2013 AMC Awards with a show stopping performance by Bryan himself. With great success, the album ranked high on the country music charts, and captured the attention of fans around the globe. In March of 2014, Bryan performed his sixth annual show at Spinnaker Beach Club in Panama City Beach, Florida. He then proceeded to release an album which included six of his number one hit singles, making him the first country star to do so. In 2015, Bryan performed at the Thanksgiving match-up featuring the Dallas Cowboys and Carolina Panthers, and most recently, Bryan flawlessly performed the national anthem at the 2017 Super Bowl in Houston, Texas.